Do you love the colorful history of the Wild West? We do too. We took a side trip to historic Deadwood, South Dakota during our family vacation to the Black Hills. Deadwood is famous for its legends as much as its actual history as a 19th century Old West mining town. 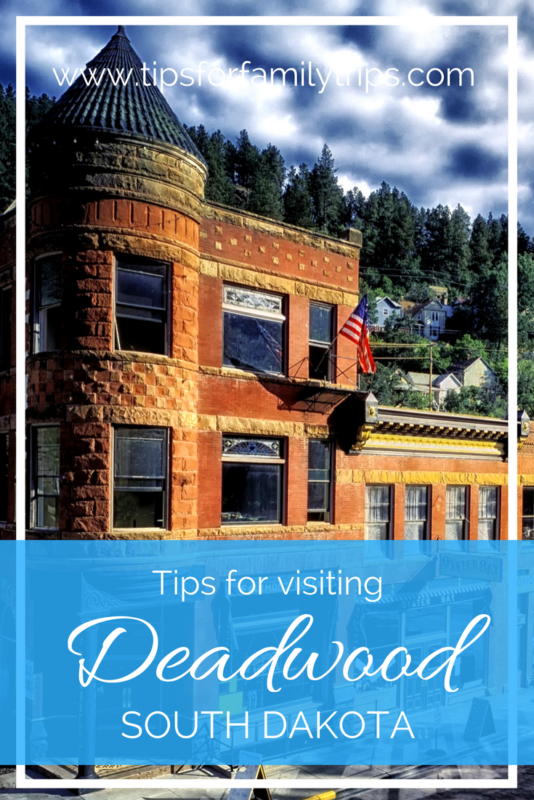 Today, visitors flock to Deadwood to connect with history and try their luck in one of Deadwood’s gambling halls just as “Wild Bill” Hickock and other famous gamblers once did. Our first and only stop in Deadwood was Mount Moriah Cemetery, popularly known as Boot Hill. This cemetery is a popular tourist stop and there is an admission fee of $2. There is also a small visitor center, but it was not open when we were there. The most famous people buried at Mount Moriah are “Wild Bill” Hickock and Calamity Jane. The real Calamity Jane probably did not bear much resemblance to the movie character played by Doris Day, and her relationship with “Wild Bill” may have been more imagined than real. Nevertheless, her dying wish that she be buried next to him was granted. My husband and I love history and we like cemeteries. It was interesting to learn about other colorful characters that I had not heard of and I enjoyed reading the headstones of less famous Deadwood residents. It was also interesting to see the Chinese and Jewish sections of the cemetery. The other worthwhile reason to drive up to Mount Moriah and wander its hilly terrain is its panoramic view of Deadwood nestled at the base of the scenic Black Hills. It’s beautiful. Thirty to sixty minutes is about right for a visit to Mount Moriah. Our young children ran out of patience after an hour in the cemetery, which was understandable. We made a pass through downtown Deadwood, but seeing mainly casinos, bars and shops, we decided get the heck out of… Wait, that’s a different place. Downtown Deadwood is attractive and walkable, but it’s less family-friendly than most other destinations in the Black Hills. There are several family attractions, but with over 100 “Old West” gaming halls and bars, Deadwood is primarily a destination for adults. Deadwood is located about 40 miles northwest of Rapid City. You can drive most of that distance on Interstate 90, but on the way there, we decided to take the scenic route along Highway 385. That road rewarded us with beautiful lakes and forests and hills, different enough from the Black Hills beauty south of Rapid City to make the it worth the effort. Where: On Mt Moriah Drive, east of Deadwood. Take Lincoln from Sherman Street and follow it up the hill to Mt. Moriah Drive. When: Mount Moriah is open from Memorial Day to mid-October during daytime hours. It is open occasionally during the winter.